If you are looking for a funny Christmas t-shirt that could work as an ugly Christmas t-shirt then this is it. On the shirt, you can see a frog playing Santa Claus and he is wearing the famous Santa hat and a big red bag for presents and there is a present on the floor to. You can get this Santa frog t-shirt in many cool colors and in size Small – 6XL and it does come in styles for both men and women that are looking for something different this Christmas. This could be your ugly Christmas t-shirt and I am sure it will bring many smiles to the world. Do you enjoy your music while roaming the streets? If so then you probably look like the frog on this t-shirt. This frog has some nice headphones and is rocking away with his music. And if you just look anything like this with you big headphones or if you just like frogs then this could be a great t-shirt to buy. Of course you can get this t-shirt in all kind of sizes to make it fit perfectly. 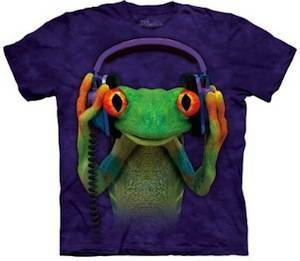 Enjoy you music even more with this DJ Frog T-Shirt. 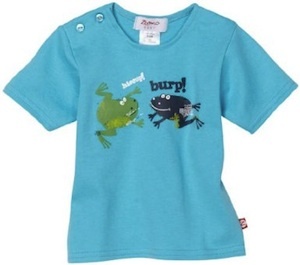 This 100% cotton t-shirt with short sleeves is cute with two frogs with burps and hiccups. It is made for small kids with sizes 6 – 24 months. And the fresh colors make it the perfect summer shirt. Hop over and check out this Froggies Short Sleeve T-Shirt.